Witness to Life begins, oddly enough, with the death of the narrator Martin Radey. Martin finds himself travelling outside of time in a sort of purgatory where he is forced to re-examine the life he's lived. Born in 1880 in Elora, Ontario (a small village 60 miles northwest of Toronto) Martin picks up the story of his life as young man living with his parents in Toronto. Martin then begins to tell the story of his life, visiting various periods from 1898 up to 1950. 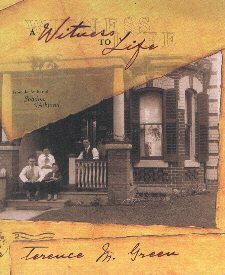 With Witness to Life, author Terence Green manages to weave a moving tale that is equal parts hope and regret. We see the promise in the lives of young Martin and his family and the regret that accumulates as time passes Martin by. In death Martin relives these moments trying to garner some meaning from the turns his life has taken. What make this novel such a fascinating read is not only the story of Martin Radey and his family, but the manner in which Green has succeeded in bringing to life Toronto of yesteryear. Interwoven in Martin's narrative are rich descriptions of neighbourhoods and events, such as the Toronto fire of 1904, all of which help place the characters within their historical setting. I was pleased to see that the author had been thoughtful enough to include a simple although detailed map of Toronto in the preface of the book to assist the reader in orienting themselves with the various neighbourhoods that Martin mentions throughout. Taken on a whole Martin's life would seem rather unspectacular but, as with most ordinary people, it's the small triumphs and tragedies that make for a rich life. It was these very combinations of hope and regret that I found so moving in the novel. At times I was reminded how short life can be and how we often look back in regret at the time we've wasted. A sense of hope would kick in when I realized that how much in life we should be thankful for and that its not too late to appreciate life. Green's intriguing premise of a time travelling soul allows him to neatly compress seventy years of Martin's life into a concise tale whose pace manages to hold the reader's interest while devoting sufficient time to examine key periods in Martin's life. As with Kurt Vonnegut Jr.'s novel Timequake [ Review Here ] the reader is left with a unique perspective on the nature of time and how any given individual's life is the an arc through time created by the cumulative effect of everyday choices. Readers interested in Witness to Life may want to check out another book by Terence Green - Shadow of Ashland. Ashland was published prior to Witness to Life and involves descendents of Martin Radey and incorporates an element of time travel as well. While Shadow of Ashland explores similar territory, it is a very different novel in many ways and is very capable of existing on its own as a novel. Terence Green's personal website complete with bio, bibliography and links to reviews and details of his various books. Good place to order autographed copies of Terry's work or to catch up on what he's been up to. My review of Terence Green's novel Sailing Time's Ocean (2006) which uses time travel as a literary device.